Gorgeous paper bunting from the Tiny Feet party range. 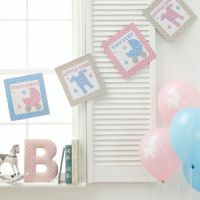 Produced from high-quality, durable paper, this bunting adds a stylish touch to décor for christenings, naming ceremonies or baby showers. Measuring 3.5 metres in length, Tiny Feet bunting features square flags adorned with polka dots, stars and pretty illustrations in a baby theme, alongside text reading ‘Little Star’, ‘Tiny Feet’ and ‘First Steps’. With its unisex colours and contemporary design, this paper bunting makes a wonderful addition to your décor.